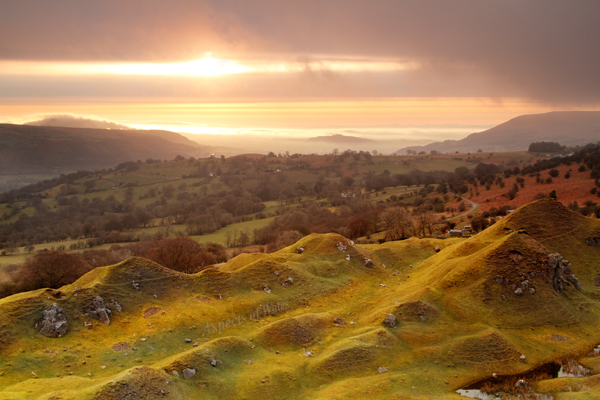 The limestone cliffs of Llangattock Escarpment were quarried in the 18th and 19th centuries, leaving behind a magical landscape of vegetated spoil heaps. The escarpment is north-facing (with wonderful views of the Black Mountains) so I figured that to get the best morning light I'd need to visit in spring or early autumn, or get up ridiculously early in the summer. This photo was taken soon after sunrise on 1st April 2016 at NGR SO2014915695. Canon EOS 7D, Canon EF-S 17-85mm lens at 28mm, 0.9 ND grad, Manfrotto tripod. Exposure F11 at 1/8 sec.